"One of the Top 20 Yoga Retreats in the World" as named by The Times and The Guardian, Yoga Explorers' retreat to Tigmi has been running for 7 years and continues to be an international favourite. 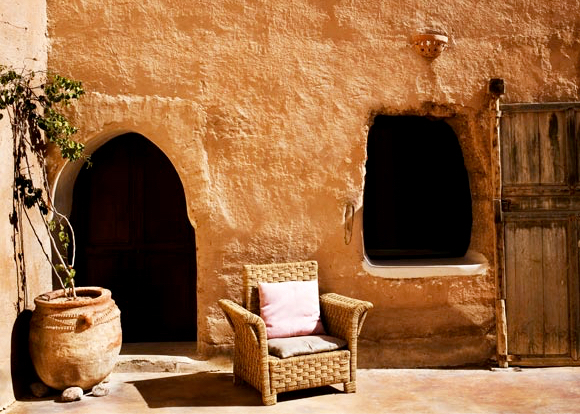 Set in the tranquility of a Berber Village with a backdrop of the Atlas Mountains and the distant twinkle of the ancient city, meandering flower-lined paths lead through scented gardens and secret courtyards to exquisite A/C ensuite bedrooms, all beautifully furnished in the local style. Named one of the Top 12 Ethical Hideaways, Harper's Bazaar describes Tigmi as "a blissed-out haven that mixes style with substance". With its view of an ancient kasbah and its backdrop of snow-capped peaks you would never know this rustic chic retreat is just 15 miles from the buzz of Marrakech. The rooms are all very generously sized, with traditional Berber woven tapestries on the beds, and locally made natural products in the bathrooms. Beds are large and comfortable, and the walk in showers are simply designed and spacious. Fluffy towels and robes are provided, and each room features a seating area for quiet moments. With their thick walls, the rooms stay naturally cool even in summer, though air conditioning is provided. And for any chilly nights, they’ll come and light a log fire in your room - magical! Take your time after yoga with the delicious buffet breakfasts. They offer everything you could wish for, all kinds of cereals, eggs, breads, fresh fruits, stewed fruits, nuts, local honey and homemade yoghurt along with the best freshly squeezed orange juice we've ever tasted. Lunch is a leisurely affair too. A fabulous array of salads is laid out for you to graze at as and when you drag yourself along from the pool. They use really fresh ingredients prepared with great care to make a wide variety of healthy and delicious treats. And finally dinner - 3 courses no less! The chefs prepare a set menu that tends to fuse traditional dishes with a touch of French cuisine. Bread and delicious dips to start, perhaps Moroccan spiced pastry parcels to follow, and dishes like tagine or fresh fish for mains, and it’s with dessert that they seem to particularly raid the French style - with divine chocolate or fruit based treats. Wine, beer, and other alcoholic drinks are available as extras for those who would like them, you can just charge it to your room. Vegan and vegetarians diets are also catered for very well, just let us know any preferences in advance on your booking form. Between classes, lounge on the comfortable beds by one of two fabulous pools, explore the beautifully scented gardens of citrus trees, roses, hibiscus and bougainvillea. Discover one of the many hidden peaceful spots to read and relax, or experience a true taste of Morocco with an elaborately poured mint tea on the terrace. Tigmi features a fabulous spa and hammam (traditional bath house), both of which use natural, chemical-free ingredients sourced nearby. Mst days they have two therapists working, so there are plenty of appointments to go round. Download the spa price list. Visit the must-see UNESCO world heritage site of the Medina (old city) of Marrakech... Take the free shuttle or hire a driver to transport you into the heart of the Medina of Marrakesh and experience the magic of the ancient city. Snake charmers, acrobats, musicians and story-tellers await you in the main square, Djemaa el Fna, while narrow streets lead into the labyrinth of souks, alive with colour and sound. Most people find it an extraordinary an unmissable experience, although slightly exhausting - prepare to haggle and shop till you drop! Walking and exploring the local area... Beautiful and fascinating walks can be taken in every direction from Tigmi. From a walk around the local village to the wide-open terrain leading towards the foothills of the High Atlas Mountains. Tours can be arranged by the Tigmi team for half- and full-day trips. The international Menara airport in Marrakech (RAK) is easily accessible via non-stop flights from dozens of European cities. You can also fly in via Casablanca if you don’t mind changing planes there. Transfers from Marrakech Menara airport take about 20 mins in a taxi and cost around £15. This can be paid as part of your hotel bill when you check out so no need to worry about getting hold of currency in advance. We can arrange these transfers for you once you know your flight details, and if people are on the same flight as you, we can suggest shared transfers to split the cost.